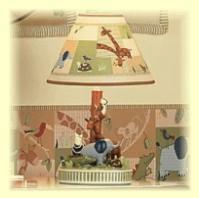 Baby lamps are a decorative and effective way to provide lighting in your baby nursery. You won't want to flood the nursery room with light every time you have to change a dirty diaper or look for a lost pacifier. Keeping baby in a sleepy state throughout these minor interruptions is an art that you will learn over time. Soft nursery lighting that doesn't blast the whole room will give you a good head start. Our Favorite Baby Lamps Online! You'll be spending many a late night hour cozied up in the nursery room with your precious newborn. It's not unheard of for mom to doze off in the nursery glider with baby in her arms. Should heavy eyelids override your efforts to make it back to bed, you'll be glad of a light switch near by. Getting up to turn off the light would really ruin the mood! Look for a lamp with a switch on the lamp cord rather than the base - it will be easier to reach. And baby won't enjoy being woken up from a comfy sleep with a burst of bright light. Make sure the lamp you choose casts a calming, soft light. Not too bright and not too harsh. They are available in many different designs and themes. Most bedding sets are available with table lamps to match. Some table lamps even have a built in night light. Baby nursery floor lamps are not as easy to find as table lamps but they are a good choice if you don't have enough space for your lamp on the nursery table. If you can't find one to match your decor, shop outside the baby section and look for a really pretty stand. You can buy nursery lamp shades from the baby department to go with it or you can always decorate your own. Bear in mind that nursery floor lamps usually illuminate a larger area than the conventional baby room lamp because of the height of the bulb. Wall lamps are a good option if you have a small baby nursery or if you are short of wall sockets. They light up a defined area and do not use up valuable nursery table or shelving space. 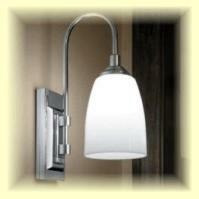 Some wall sconces even allow you to direct the light to exactly where you need it. It's best to use florescent bulbs. They do not get as hot as conventional bulbs and are, therefore, less likely to burn curious little fingers. Don't forget to choose the bulb with the correct wattage for your lighting requirements. If your lamp is too bright, changing to a lower wattage bulb can make a big difference. Remember, the darker your nursery lamp shade, the more subdued your nursery lighting will be (unless the shade has a white inner lining). Make sure you choose the right size shade for your lamp stand. Test a few different sizes before you buy. If you grow tired of your baby room decor, you can create a whole new feel in the nursery by picking up a different accent color. A new nursery lamp shade is one of the easiest and least expensive ways to make a change. You can even recover the old one. Combine this with a new pillow on your nursery glider, and you're good to go. Check out this selection of lamp shades from Dimples and Dandelions! With cute, decorative baby lamps you can light up your baby nursery in style. How you go about it is limited only by your imagination! Check out our nursery chandeliers and other baby ceiling lights and nursery night lights pages for your other nursery lighting requirements. And don't forget to take a look at our favorite baby lamps online!